Among all news media, television continues to be the number one news platform for Latinos. According to the Pew Hispanic Center survey, in 2012, 86% of Latino adults say they get their news on a typical weekday from network, cable or local television news, down slightly from 2006 when 92% said they got their news from television sources. 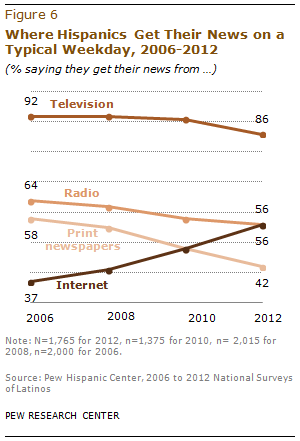 The share of Latino adults who say they get their news from radio declined from 64% in 2006 to 56% in 2012. By comparison, the share of Latino adults who get their news on a typical weekday from print newspapers has decreased considerably, from 58% in 2006 to 42% in 2012. Meanwhile, the share of adult Latinos who consume news from internet outlets has increased steadily, from 37% in 2006 to 56% in 2012. How Many News Platforms Do Latinos Use? The Pew Hispanic survey asked survey respondents whether they get news on a typical weekday from one of four different news media platforms—television, print newspapers, radio and the internet. Across these four platforms, Latino adults on average use 2.4 platforms when they consume news media. Looked at another way, 15% use all four platforms tested, 33% use three, 32% use two, 17% use one and just 3% of Latino adults do not use any of the four news media platforms. 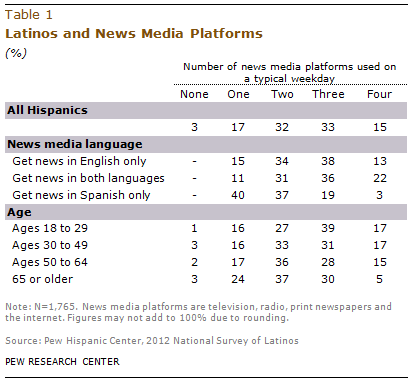 How many news media platforms Latinos use is correlated with the language of news media consumption. Among Latinos who consume news media in both languages, 22% use four news media platforms, 36% use three platforms, 31% use two platforms and 11% use just one news media platform. Latinos who consume news media only in English use nearly as many news media platforms: 13% use four media platforms, 38% use three platforms, 34% use two platforms and 15% use just one platform. However, Latinos who consume news media only in Spanish use fewer news media platforms than other Latinos. Just 3% use all four news media platforms, 19% use three platforms, 37% use two and 40% use only one platform. Among those who use only one platform, 85% use television to get news on a typical weekday. The number of platforms used when consuming news media also varies by age. Overall, Latinos ages 65 and older use fewer platforms than younger Latinos. The news media platform used is also correlated with the number of platforms used. For example, among Hispanics who get news from television, 18% use all four platforms and 13% use just one platform. By comparison, among Hispanics who get news from print newspapers, 36% use four platforms while just 1% use one. Hispanics who get news from radio and internet platforms also use more platforms than those who use television. What Language Do Latinos Use with Each News Media Platform? 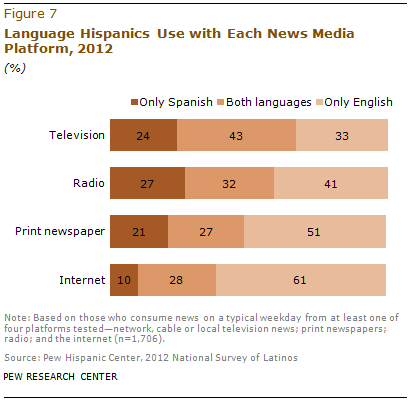 The language Hispanics use when consuming news media varies with news media platform. Overall, television has the highest share of Hispanic news consumers who get their news in Spanish. Two-thirds (67%) of Hispanics who get their news from television do so only in Spanish (24%) or do so in Spanish and English (43%). By contrast, Hispanics who get their news from print newspapers and the internet do so largely in English. Among Hispanics who use print newspapers, half (51%) do so only in English, 21% do so only in Spanish and 27% do so in both languages. The share who get news only in English is even higher among Hispanics who get news from the internet. According to the survey, 61% of Hispanics who get news from the internet do so only in English, 10% do so only in Spanish and 28% so do using both languages. Who Gets Their News from Television? Fully 86% of Latino adults say that on a typical weekday, they get news from network, local or cable television news, with large majorities of demographic subgroups of Latinos saying they get news from television on a typical weekday. However, some small but notable differences are revealed by the survey. Use of television for news is correlated with the language of news consumption. While about nine-in-ten Latino adults who get their news only in Spanish (93%) or in both languages (91%) do so from television, a lower share (82%) among those who get news exclusively in English get it from television. Television use is also correlated with age. Fully 93% 0f Latino adults ages 65 and older say they get their news from television on a typical weekday. By contrast, among Latinos ages 18 to 29, 83% say they do this. News consumption from television varies little across other demographic subgroups. Across immigrant generations, for example, television use rates are virtually the same: 87% for immigrants, 85% for those of the second generation and 82% among Hispanics in the third or higher generation. Who Gets Their News from Print Newspapers? About four-in-ten (42%) Latino adults say that on a typical weekday, they get news from print newspapers. However, consumption of news media from print newspapers varies by several demographic characteristics, including age, nativity and the language of news consumption. Among Latinos ages 18 to 29, 36% say they get news from print newspapers on a typical weekday. By contrast, 54% of Latinos ages 50 to 64 and half (49%) of Latinos ages 65 and older say they do the same. Use of print newspapers is greater among native-born Hispanics than foreign-born Hispanics—46% versus 39%. And among the native born, Hispanics in the third generation are more likely than second-generation Hispanics to use print newspapers to get news—53% versus 41%. Latinos who consume news media exclusively in Spanish have the lowest rate of print newspaper consumption (30%). By comparison, Latinos who consume news media in both English and Spanish are most likely (50%) to say they get news from print newspapers on a typical weekday. Who Gets Their News from Radio? Some 56% of Hispanic adults say they get news on a typical weekday from radio. Just as with other news platforms, news consumption from radio varies some among different demographic subgroups of Latinos. Among Latino adults, those who consume news media in both English and Spanish are more likely to use radio (65%) than those who get their news in only one language, either English (54%) or Spanish (45%). Similarly, Hispanics who are bilingual (61%) are more likely than Spanish-dominant Hispanics (51%) to get news from radio on a typical weekday. Among English-dominant Hispanics, 54% say they get news from radio. Younger Latino adults are also more likely to get their news from radio—59% of those ages 30 to 49 and 57% of those ages 18 to 29, compared with 47% of those ages 65 and older. Who Gets Their News from the Internet? Overall, 56% of Hispanic adults say they get their news on a typical weekday from the internet. As with other news platforms, use of the internet for news varies among demographic subgroups of Hispanics. Among the most likely to get their news from the internet are Latinos ages 18 to 29 (78%), Latinos with family incomes of $50,000 or higher (76%) and those with at least some college education (75%). By contrast, Latino adults who get their news exclusively in Spanish and those ages 65 and older are the least likely to get their news from the internet—18% and 21%, respectively. Native-born Latinos are 25 percentage points more likely than foreign-born Latinos to say they get news from the internet—70% versus 45%, respectively. Latinos who consume news media only in English (73%) are more likely to get their news from the internet than those who consume news media in both English and Spanish (63%) or exclusively in Spanish (18%). Use of the internet for news is also correlated with educational attainment. Three-in-four (75%) Latino adults with at least some college education say they get news from the internet on a typical weekday. This compares with 60% among those with a high school diploma and about a third (32%) among those without a high school diploma. Family income is another demographic characteristic that differentiates the rate of internet use for news consumption. Among Hispanic adults, 76% of those with family incomes of $50,000 or higher say they use the internet to get news, as do two-thirds (67%) of those whose family incomes are $30,000 to less than $50,000. By comparison, half (50%) of those whose family incomes are below $30,000 do the same. Who Gets Their News from Social Networking Sites? Half (47%) of Hispanic adults say they “regularly,” “sometimes” or “hardly ever” get news or news headlines from social networking sites such as Twitter or Facebook. Just as with those who get their news from the internet, the share of who gets their news from social media is greatest among younger Latinos. About seven-in-ten (69%) Latinos ages 18 to 29 say they get news or news headlines from social networking sites. By contrast, just 9% of Latino adults ages 65 and older do the same. Differences in the use of social networking sites for accessing news among Latino adults vary among most demographic subgroups. English-dominant Latinos are more likely to get their news from social networking sites than those who are bilingual or Spanish dominant—59%, 49% and 35%, respectively. Latino adults with higher educational attainment are also more likely to say they get their news from social networking sites. A larger share of Latino adults with at least some college education (57%) or a high school diploma (56%) say they do this, compared with 29% of those without a high school diploma. Family income is another demographic characteristic that differentiates the rate of social media use for news consumption. Among Latino adults, about six-in-ten of those with family incomes of $50,000 or higher (59%) and family incomes of $30,000 to less than $50,000 (58%) say they use social media sites to get their news. This compares with 44% of those whose family incomes are below $30,000.